Chicago’s energy deal: An ‘F’ for fracking? Fracking operation near Shreveport, Louisiana. Curious citizen Janice Thomson says she felt duped by the definition of clean energy Chicago used in electricity aggregation language. The Crawford coal-fired electricity generating facility, one of two southwest side coal plants closed in 2012, sits along the Chicago Sanitary and Ship Canal. 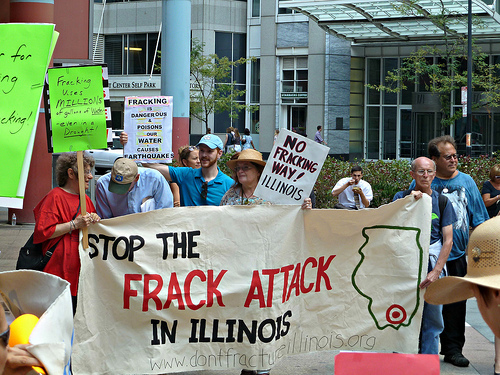 A protest against fracking in Illinois from July 2012. 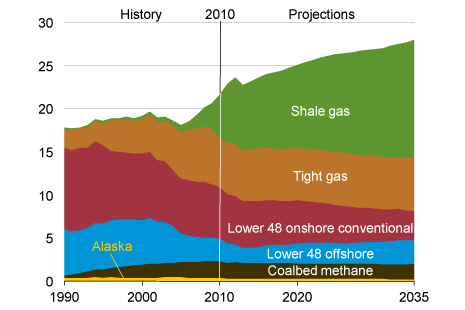 The natural gas supply, according to U.S. EIA's Annual Energy Outlook 2012, in trillions of cubic feet per year, projected to 2035. Unconventional gas plays a significant and growing role. Outside Evanston's Chandler-Newberger Community Center, the city's newly installed Ice Bear whirs on a hot summer day. The system makes ice to store energy at night, when electricity generation is less expensive, and releases it as the ice melts during the day to cool the building. 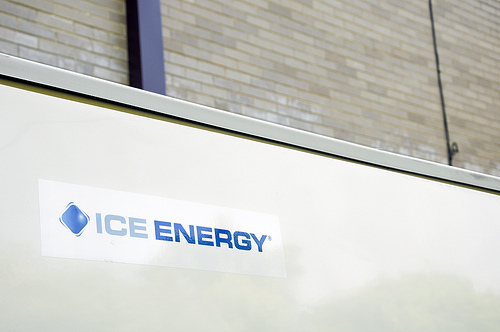 A pilot project, the Ice Bear is part of Evanston's electricity aggregation deal with energy supplier Verde. Editor&apos;s note: Chris Bentley answered Janice Thomson&apos;s question about a week before Chicago&apos;s City Hall announced new developments regarding the municipal aggregation deal mentioned here. In an update, we take another look at the question posed here, given that there&apos;s new information on the role of wind power and natural gas in the city&apos;s municipal aggregation contract. But Janice&apos;s question also prompted us to wonder if other people are considering choosing alternative electricity providers. We&apos;ve been hearing from many people about why or why not. You can have your say right now as well. Curious Citizen Janice Thomson does not consider herself an environmentalist. After five years living in Brussels, Belgium she got used to regular media coverage of climate change and renewable energy. Back in the U.S., even a record low in arctic sea ice failed to elicit any mention of the issue during the 2012 presidential debates — the first time that has happened since 1988. “When I came back to Chicago [in 2011] I was looking for a renewable supplier for my energy,” Thomson said. Along with about 56 percent of Chicago voters, she voted yes on the 2012 referendum for municipal electricity aggregation, hoping it would expand the market for wind and solar power. Then she got a letter from Integrys Energy Services, the city’s new electricity supplier, touting the city’s “cleaner” energy supply. 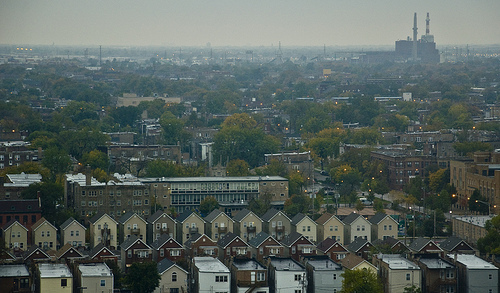 Chicago struck a two-year contract with Integrys, replacing Exelon subsidiary Commonwealth Edison and reportedly saving households $150 on average per year by 2015. Crain&apos;s Chicago Business reported Integrys won the deal with a fee of about $8.8 million, about two thirds the price of runner-up Exelon. Energy prices change daily, and low prices are not guaranteed forever, but the contract gives the city an option to switch after May 2014. Jennifer Block, a spokeswoman for Integrys, said the new fuel mix would be “primarily” natural gas. Integrys buys electricity wholesale from many power plants and passes it along to distributors like ComEd. The company won’t divulge which power plants it buys from, which can and do vary constantly based on the price of those power plants’ electricity. Integrys can’t track individual electrons as they make their way through the grid, so Chicago’s no-coal requirement just means Integrys will need to verify that at any given time they have enough non-coal power in their possession to satisfy all of the city’s demand. Because it is currently inexpensive, natural gas-fired electricity will satisfy the brunt of that demand. But for Thomson and self-identifying environmentalists alike, trading one fossil fuel for another might be considered a Pyrrhic victory at best. “I didn’t know that clean energy wasn’t the same as renewable energy,” Thomson said. The city’s requirement that its new energy supplier drop coal was the first of its kind, and the Chicago Clean Power Coalition endorsed aggregation as a means to promote renewable energy in the future. Currently the city’s deal only requires Integrys to meet the state Renewable Portfolio Standard (RPS), which rose this year to 7 percent. The RPS ramps up gradually in pursuit of the state’s 25 percent by 2025 goal. Solar, wind, biomass, hydroelectric, anaerobic digestion, biodiesel and landfill gas — methane, essentially natural gas, recovered from landfills — count towards the state’s RPS, but natural gas mined from the earth through fracking or other methods does not. According to the Environmental Protection Agency, natural gas-fired power plants emit about half as much carbon dioxide, less than a third as much nitrogen oxides, and one percent as much sulfur oxides as coal plants. That’s the main basis for calling natural gas a “clean” fuel — it’s clean compared to coal. Thomson shares many environmentalists negative opinion of the controversial drilling process of high-volume hydraulic fracturing, commonly known as fracking. Joining the religious environmental consortium Faith in Place on a lobbying trip to Springfield, Janice helped call for a moratorium on fracking, and then later, when an outright ban seemed unlikely, for strong regulations on the practice. Governor Pat Quinn signed the regulatory bill into law on June 17. While emissions from natural gas power plants are substantially lower than those from coal plants, the process of extracting and transporting the resource is fraught with technical challenges. “Unconventional” oil and gas resources are so-named because they have previously been impossible to dig up economically. But innovations in drilling technology have brought together fracking, in which drillers blast water, fine sand and chemicals to break up porous rock containing fossil fuels, and horizontal drilling, which allows a single rig to explore long, flat sedimentary rock formations thousands of feet underground without drilling straight down from the surface many times. The resulting practice has opened up massive stores of previously out-of-reach oil and gas. It has also sparked environmental concerns. When well casings fail, for example, fracking fluid and other material can contaminate groundwater. Drillers recover much of the fluid used in fracking, but some is left deep underground. And in areas stricken by drought, the water-intensive process has sparked fights over water use. Then there’s global warming. Methane, the primary component of natural gas, is a far more potent greenhouse gas than carbon dioxide, and how much of it leaks into the atmosphere as a result of fracking is a topic of heated debate. Many environmentalists argue even if methane leakage is low, the math says we have to start leaving fossil fuels in the ground to avoid catastrophic climate change. The drilling industry calls Illinois’ regulations the toughest in the nation, noting provisions for water quality monitoring and oversight from state environmental agencies. In 2010 Congress ordered the EPA to investigate whether fracking posed risks to drinking water, with results expected in 2014. The results of that study were recently delayed until 2016. Drillers have already leased land in 17 Illinois counties and, according to an Associated Press investigation of state records, at least one company has already attempted high-volume fracking in the state. But the Illinois Oil and Gas Association’s Brad Richards said it will likely be at least six months before the first permit is issued. “Realistically this thing’s a year or more out before we see any significant production going to market,” Richards said, noting that test wells first need to verify how much oil and gas is actually in Illinois’ New Albany Shale play. Drilling itself takes time, and pipeline infrastructure would have to be built to transport large quantities of gas. Conventional production in Illinois is almost entirely oil, with very little gas. So especially in the near term, Chicago’s natural gas-fired electricity almost certainly isn’t coming from downstate. Nationally about 40 percent of U.S. natural gas production was from shale formations in 2012, according to Jonathan Cogan of the U.S. Energy Information Administration. That share is growing, so it’s likely that at least some of the electricity Integrys buys from natural gas power plants comes ultimately from fracking. It’s impossible to tell exactly how much fracked natural gas ends up as electricity in Chicago, Integrys’ Jennifer Block said. The same problem afflicts opponents of particular types of oil. Someone like our Curious Citizen who wants to avoid any connection with fracking could opt-out of the Integrys program altogether without a cancellation fee. Many suppliers offer customers “100 percent green” options, which generally rely on Renewable Energy Certificates (RECs). Essentially renewable energy derivatives, RECs accumulate at any renewable energy power plant that generates electricity. A wind farm in Iowa, for example, could sell its RECs to a city in Illinois looking to offset pollution from a predominantly fossil fuel-fired electricity supplier. Consider Evanston. The north suburb’s own electricity aggregation deal calls for an audit of the electricity supplier — at first Constellation, now Verde Energy — to make sure they are purchasing enough RECs to offset 100 percent of the city’s electricity use. According to their most recent environmental disclosure statement, Verde’s actual electricity still comes mostly from fossil fuels. 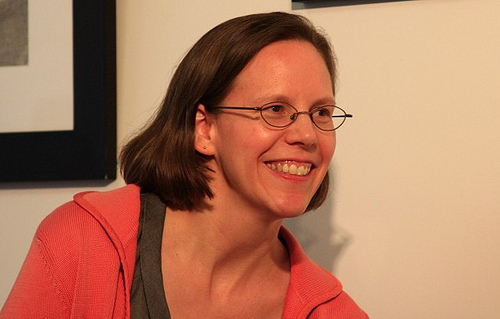 But Evanston’s sustainability coordinator, Catherine Hurley, said RECs move the market nonetheless. Verde’s contract with Evanston offsets 100 percent of the city’s energy with RECs at a rate lower than competitors. And no matter what supplier a consumer chooses, there is one universal option to lessen demand for nonrenewable resources. RECs may not be the ideal means of encouraging renewable energy deployment, but they are a useful tool for communities like Evanston that aren’t near many utility-scale renewable energy power plants. Likewise municipal aggregation itself could give a voice to citizens who want more control over their power supply.